PC, Precast concrete, generally refers to the concrete structure which is assembled, connected and casted partly by using concrete prefabricated components as main component. 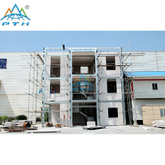 Recently, it is widely been applied in residential and industrial construction project as one kind of structural style. 1. 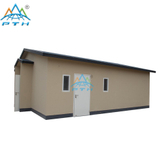 Shorter construction period: Major components can be prefabricated in factory, and delivered to the construction site with assemble. So it can save up to 1/3 construction period. And also it can reduce influence for surroundings because of the shortened time for mold and ripping of cast structure and maintain time for concrete. 2. Energy conservation and environment protection: By perfect technology economic effect with fewer wet work in scene which can reduce waste of materials and energy; in favor of environment protection and keep people away from noise and dust. 3. Modular manufacture and component with high precision: The size of construction conforms to the module which means we can produce component with uniformly quality and high precision with smooth surface, good appearance, size accurate and request function of insulation, heat-resistance, Water and electricity pipe layout.